ease of use – the new organization of the dashboard enables easy use and fast speed when you navigate between different monitoring reports and features. increase efficiency – as everything is fully customizable you can focus only on reports, which matter and increase your efficiency. 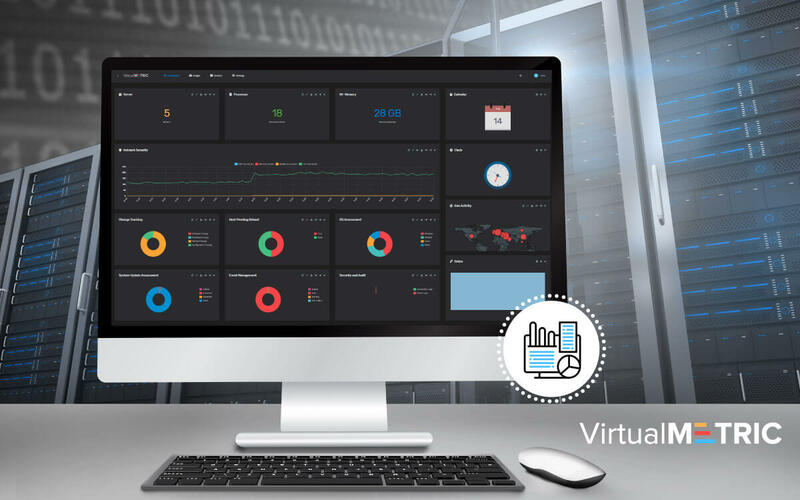 The new way in which we have organized VirtualMetric infrastructure monitoring and tracking suite provides the users with a focus on the most important aspects. VirtualMetric Dashboard – The Dashboard in the welcome screen you see when you open your monitoring solution. You can use it to put fast access to reports, embed videos with tutorials, track the most important metrics. Now you can create even multiple dashboards and include them in a Playlist. Very useful if you track live the monitoring on a TV inside your office. VirtualMetric Insights – Contains all reports – default or custom reports you have built. Create your own templates, pin them, organize them in different folders, import or export templates. Now you even have a Favourites folder, where you can add the most important or most regularly opened reports. Every report can be modified – changed or re-ordered. You can also add new queries into the reports to enrich them and make them fully match your organization needs. Add whatever you want as information to your reports. Now what you can do is to pin a specific report on top of your dashboard and to open different reports below it. In this way, you can easily discover the data correlation and maintain a detailed analysis of your infrastructure. In addition, you can apply a global filter to all pinned reports and track only the information needed. In every report, you can modify the charts and switch them to the type you need – line chart, bar chart, top chart, pie charts, etc. Depending on the data, you can visualize it in the most appropriate way. Devices – The Devices section tracks all your bare metal, virtual machines, volumes, processor load, etc. When you go to Devices, you see all the Inventory options to the left side – Security, Auditing, Hardware, Forensic Analysis, etc. We are also going to add more Inventory counters in this part of the product. Four your convenience, our engineers have included a search bar, to make it easier for you to filter the right results. With a simple right-click on any inventory, you can add all the needed reports to your Favourites section. Now you can easily drag and drop the sections – move the most important sections for you to the top. At every moment you can reset to the default settings – just click Reset Layout. Last but not least, there is a fast switch between the menus – Servers, Virtual Machines, etc. Just use the drop-down on the top. Settings – As we have said: Everything is customizable according to your needs. However, we take care also for your convenience and time and we have included a large set of default reports to make it easier for you to start. Watch our webinar and learn more about VirtualMetric’s new Dashboard and how you can take all the benefits it provides. In the webinar, our CEO Yusuf Ozturk will guide you through the new Dashboard and explain some useful tricks you can use to increase the stability and ensure the health of your infrastructure. Discover how to make data correlation bu just 2-3 clicks in VirtualMetric’s new dashboard and troubleshoot fast any issue. At VirtualMetric we believe that our infrastructure monitoring suite should be shaped together with our customers. We are grateful to all customers, who shared their feedback and help us make the software almost close to perfection!